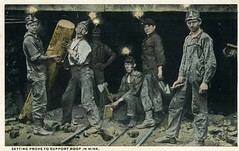 Historic Anthracite Mining Postcards by Janet. These are some postcards from my collection of Pennsylvania anthracite coal mining postcards. Note: these photos were, as far as I can tell, taken before 1923 and are therefore in the public domain. Web page by the US Energy Information Administration summarizing energy consumption, production and prices for the state of Pennsylvania. Appalachian Voices is an award-winning, environmental non-profit committed to protecting the land, air and water of the central and southern Appalachian region. Since the impacts of coal threaten Appalachia more than any other single source of pollution, we are committed to reducing coal’s impact on the region and advancing our vision for a cleaner energy future. A history of mining anthracite coal, from the geologic conditions that created it, to the mining of it to power the industrial revolution, to the eventual decline of the industry. From Explore Pennsylvania History. Contemporary occupational dust exposures have resulted over the last decade in rapidly progressive pneumoconiosis and massive fibrosis in relatively young West Virginia coal miners, leading to important lung dysfunction and premature death. These results are in marked contrast to comments recently by Senator Rand Paul (KY-R) claiming that no new coal dust regulations are necessary because the mining industry does a pretty good job of stopping black lung disease all by itself. In fact the data show that the rates of black lung decreased steadily from 1969 to 1999, but has been on the rise since. The 1184 page Pennsylvania state budget has a surprise in it; it grants the head of the Department of Community and Economic Development (DCED) unprecedented authority to “expedite any permit or action pending in any agency where the creation of jobs may be impacted.” Environmentalists are concerned that this authority will come into conflict with due process rules and environmental regulations like the Clean Air Act and the Clean Water Act. “The law requires that you not pollute the waters of Pennsylvania, and if (the governor) tries to speed up an application that makes it possible that that is going to happen then I think he is clearly operating outside of his authority.” said Deborah Goldberg, an attorney with Earthjustice. There are also concerns that C. Alan Walker, the newly appointed head of the DCED, may face conflicts of interest with his new authority. Walker is the CEO and owner of Bradford Coal, a major Pennsylvania coal company specializing in surface operations for lignite and bituminous coal, and is listed as being an executive of the Pennsylvania Coal Association. Also Walker’s companies don’t have a stellar history of environmental compliance; in 2002 three of his companies announced that they were broke and were ceasing treatment of the 175M gallons of wastewater they produced annually (they were eventually forced by a court to continue treatment as required by law). MSHA has announced the results of the January 2011 impact inspections. The inspections, which are the result of stepped-up enforcement of safety as a result of the Upper Big Branch disaster in April 2010, issued a total of 208 citations and seven orders to the fifteen coal mines on the list. MSHA was especially critical of the conditions it found in the RB 12 Mine controlled by Manalapan Mining. Inspectors found three defective gas detectors, two gas detectors that were turned off and had dead batteries, and one gas detector that was used for a pre-shift inspection was completely turned off during the inspection (when turned on it was found to be defective). Inspectors also found several electrocution hazards, that ribs and supports were not in proper condition creating a roof-collapse risk, and coal dust along a conveyor had accumulated causing an explosion risk. RB-12 was issued a total of 27 citations and orders; two other Manalapan mines were inspected resulted in 21 citations and 11 citations respectively. Ken Ward Jr., veteran reporter on coal mining, has done a detailed analysis of the controversial OSMRE study about the economic and environmental impacts of proposed rule changes for coal mining. After obtaining the entire draft documents in question through a Freedom of Information Act, he analyzes them and compares the document itself with statements about it in the recent press. A leaked working copy of a Department of Interior study of possible restrictions on coal mining includes estimates on job losses, production shifts and environmental benefits that could result of the proposed restrictions were enforced. Obtained from a Freedom of Information Act (FOIA) request by Ken Ward, Jr. at the Charleston Gazette, the document shows that Appalachian mining would be the most impacted with a 13% reduction in production over the next decade, but also a 20% in impacts to streams and land. It also shows that nationwide production would actually go up slightly as a result of the changes, but 7000 jobs would be lost nationwide, mostly in the Appalachian coalfields. The document, first leaked in portions last week, has government agencies trying to distance themselves from it. A spokesman for the Office of Surface Mining said “The current draft of the EIS isn’t OSM’s and doesn’t reflect our input or reviews. The document is a very early working draft. We have not adopted the numbers that are in the draft or any other aspects of the draft.” Calls to the director of the OSM went unanswered. A leaked proposal for reducing coal mining impacts on streams has the Obama administration’s own experts predicting the elimination of thousands of coal mining jobs and a reduction of coal production in much of the country. In 22 states, production levels would remain flat or decrease, but in North Dakota, Wyoming and Montana, production is predicted to climb 15%. Bonds died of complications from advanced cancer. A proposed mine by Penn Ridge Coal in Western Pennsylvania could result in the damage or destruction of a historic farm that has been owned by the same family for 200 years. While the family owns the mining rights directly below the farm buildings, they sold the mining rights to the rest of the farm back in 1915 and fear that the the longwall mining could destroy or contaminate the water source for the farm and the vibrations would hurt the historic buildings. State and federal permitting processes require analysis that includes the effects of the proposed mining on cultural or historical properties. Improving EPA Review of Appalachian Surface Coal Mining Operations Under the Clean Water Act, National Environmental Policy Act, and the Environmental Justice Executive Order. Published July 21, 2011. Reports from MSHA Office of Accountability reviews of MSHA inspectors in region 1. A list of the mines inspected and citations issued in the September 2010 push by MSHA to reinspect mines with a pattern of violations. A map by the EPA of abandoned coal mines in Pennsylvania.